Though not the most beautiful—nor the most diverse—hike in the area, the short, self-guided Nature Trail at Kodachrome Basin State Park is the most accessible, making this the best option for aging travelers, families with small children, and visitors in wheelchairs. The well-graded path (a hard-packed dirt-gravel mix) weaves through a dense community of junipers and pinyon pines to the base of one of Kodachrome’s 67 eccentric “sedimentary pipes”—white-capped pinnacles of stone thought by some to be the work of underground seeps. True to its name, the Nature Trail features a dozen interpretive signs spotlighting the plants, rocks, and animals of this desert environment. 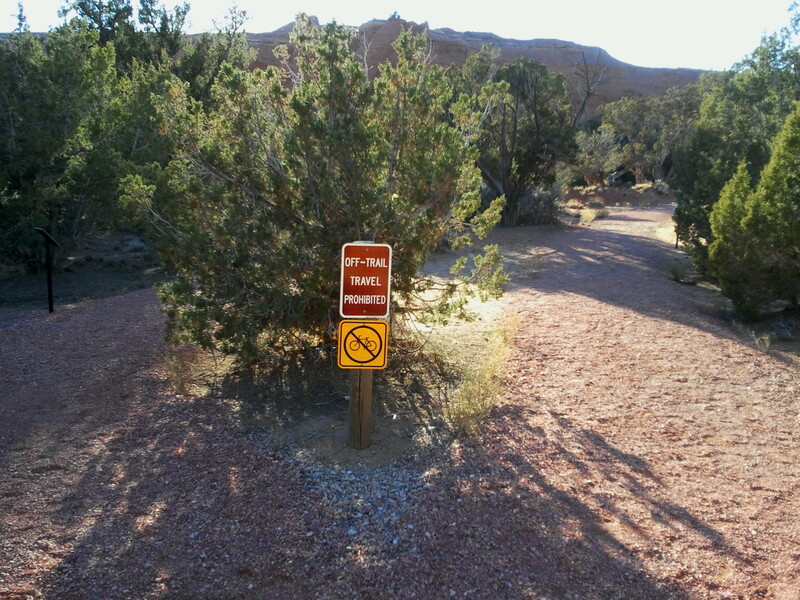 The Nature Trail loop begins and ends at a well-marked parking area one mile north of the Kodachrome Basin Visitor Center. A paved pathway quickly gives way to a slightly rougher gravel surface that is nonetheless easily navigable with a wheelchair. Almost immediately the trail forks, marking the commencement of the 0.4-mile loop. Bearing right, the trail skirts the base of a gently-sloping lump of orange-hued Entrada sandstone, the park’s most commonly-seen geological layer. 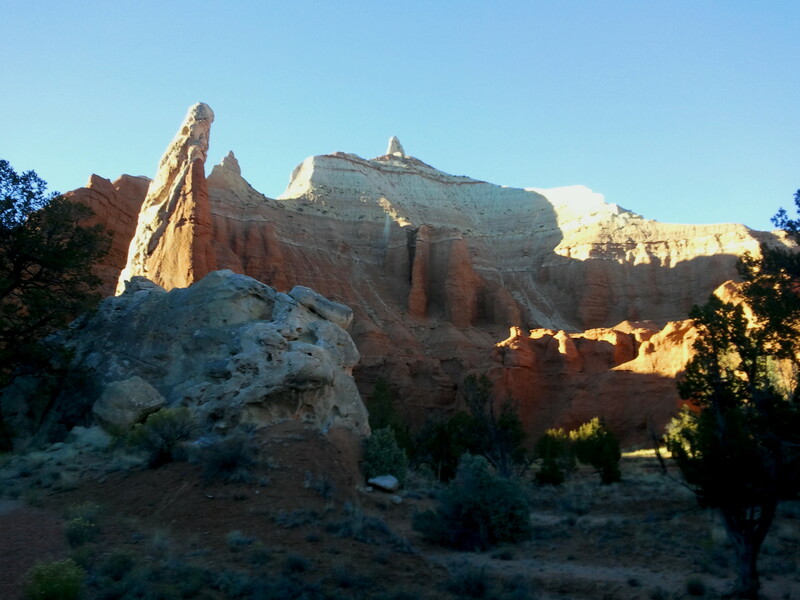 Behind it a throng of spires rises like an adobe temple; farther north, the white, wrinkling badlands of the Entrada’s Escalante Member climb taller still. A couple minutes’ walk reveals a striking view to the north of a towering sedimentary pipe. 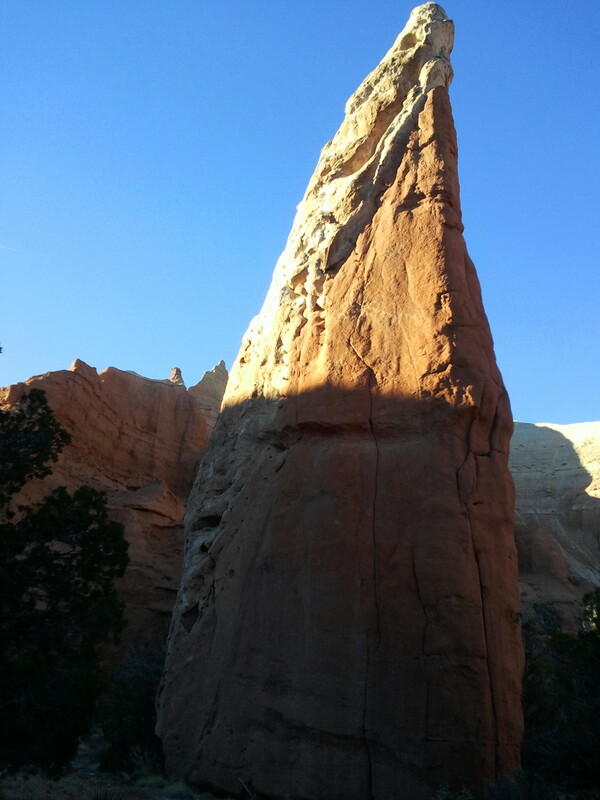 The top third of the spire is an off-white color, likely composed of an older rock layer known as the Carmel formation. While this pinnacle is viewed from quite a distance, the trail leads within minutes past the base of a second sedimentary pipe, this one taking on the look of a gargantuan shark fin when viewed from the southeast. Next to the monolith is a glob of grayish rock, likely another protrusion of the Carmel formation below. From here, the trail turns west in the direction of the trailhead. Regular signage introduces visitors to the various plant and animal species of the park; Utah juniper, roundleaf buffaloberry, and big sagebrush are among the most frequently spotted. Also interspersed around the trail are inspiring, conservancy-minded quotes from the likes of Rachel Carson and Henry David Thoreau. Off to the south, the Entrada walls are littered with solution pockets, forming what appears like a series of honeycombs. It is a short, level walk back to the trail junction—and the parking lot—from here. For quick walkers hoping to simply stretch their legs before a longer hike, allot 10-15 minutes or so for the entire loop. For a more relaxing stroll, consider taking up to an hour to absorb both the intriguing views and many interpretive panels. Ready for a longer hike? 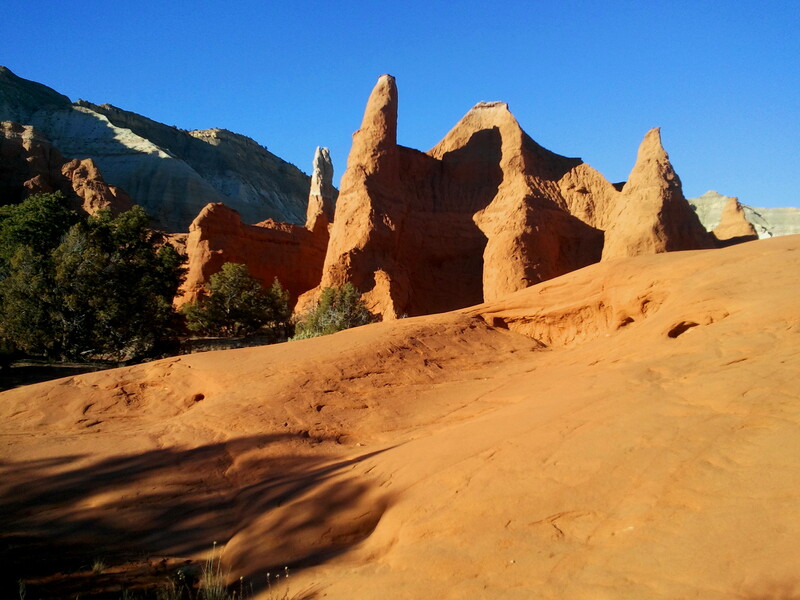 Try one of Kodachrome Basin’s four other maintained trails: the Panorama Trail, the Grand Parade Trail, the Shakespeare Arch and Sentinel Trail, and the Angel’s Palace Trail. 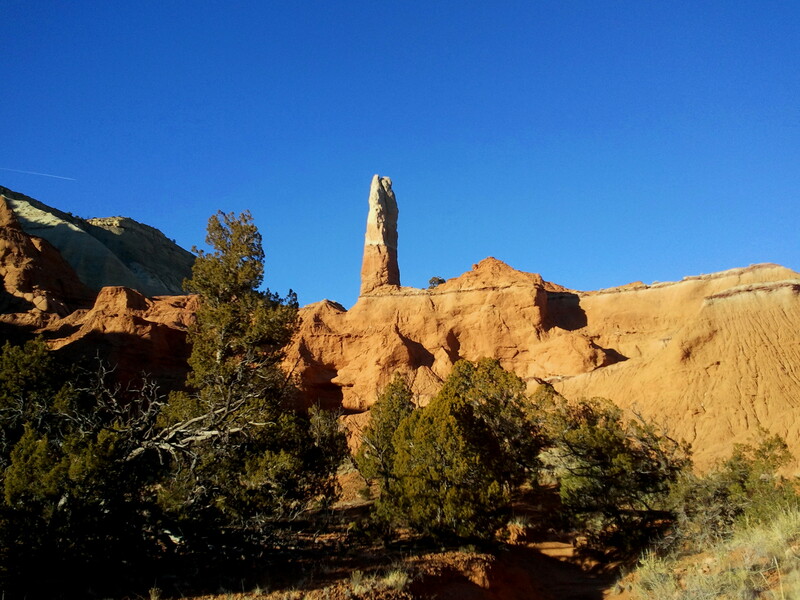 This entry was posted in Easy Hikes, Kodachrome Basin State Park, Utah and tagged Entrada sandstone, Kodachrome Basin, loop hike, Nature Trail, sedimentary pipes, spire, Utah, wheelchair-accessible. Bookmark the permalink.